I think we discovered these horrible food cravings on one of our first dates, in which he picked up dinner at McDonalds and brought back some french fries to share. What a good boyfriend I am, he thought. Bringing my girlfriend some fries. Little did he know that fries should not be shared with me, and if they are, don't expect to get any. It's a race to the finish any time either of us buys fries anymore. Oh, we pretend to eat all the other things-- burger for him, salad and parfait for me-- but really, we've got one eye on that fry carton the whole time. If one person tucks in, the other has to quickly grab a handful just so they don't disappear. I think life would be easier if we each had our own batch of fries, but somehow this has yet to occur to us. We happened to be at Urban Outfitters one afternoon and I came across a spiral notebook that had written on the front: "I love you more than French Fries." I showed it to Tanner, and the phrase quickly found its way into our lives. "Goodbye," I say to him before work. "I love you more than French Fries." "I love you more than oreo milkshakes," he says in reply. In honor of the deliciousness of French Fries (don't judge... you have your food vices too, I know) I whipped up a homemade batch last night that is considerably more healthy for you than the fast food kind. It's a simple recipe that uses extra-virgin olive oil and cornmeal to substitute for the fried texture and flavor. After my batch was gone in five minutes, I would call it a winner. Preheat oven to 400 degrees. Spray a baking sheet with oil. 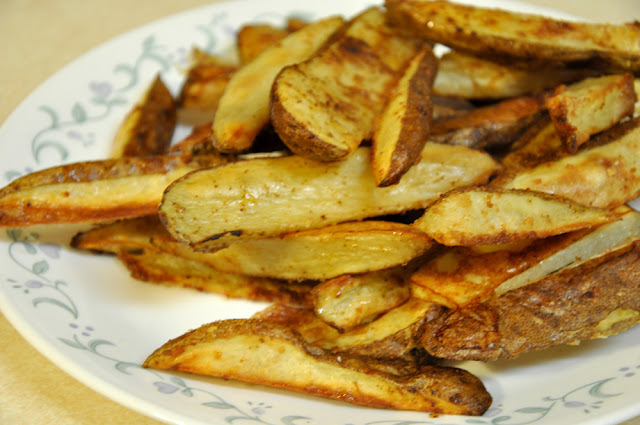 Cut each potato into wedges or thin sticks. 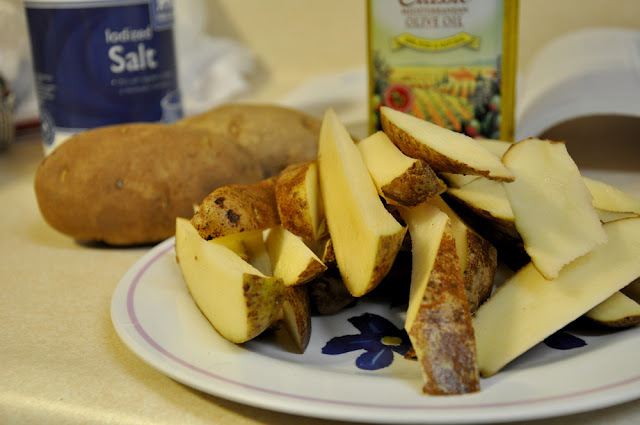 In a large bowl, toss the potatoes with the egg whites, olive oil and salt, coating evenly. Dust the potatoes with the cornmeal and spice mixture. 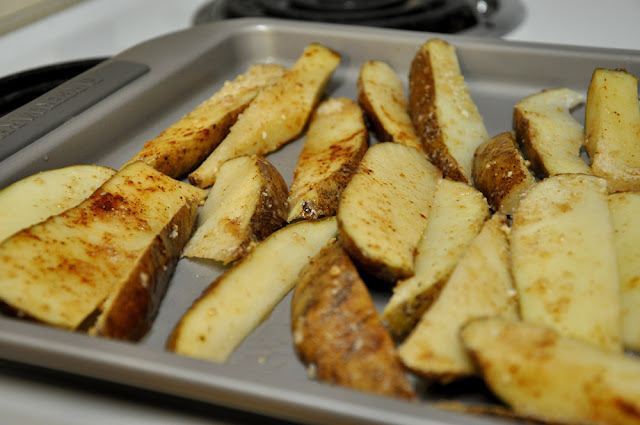 Spread the potatoes on the baking sheet in a single layer. Bake 50-60 minutes or until golden brown. Serve with ketchup!